Below you can read an extract from the memoirs of Albert Turpin (1900-64), Artist, Anti-Fascist, Window Cleaner, & Mayor of Bethnal Green, written between 1945 and 1947 and published now for the first time. Entitled THE EAST END, My Birthright, it will be launched on Wednesday 18th October from 6pm at the Nunnery Gallery at Bow where a retrospective of Albert Turpin’s paintings is currently on show. There will be readings by Michael Cashman and all are welcome. Bethnal Green is accepted all over the world as a typical home of the Cockney who, by his outstanding characteristics, has made himself a well-known figure in story and song. To anyone who has only known Bethnal Green in our times, the name seems very fancy, but for most it has been ordinary working class houses with parts degenerating into the most dilapidated, stinking slum. Alley and narrow street form themselves into a maze that can trap a stranger for long periods. In fact there was, until recently, a patch of these alleys in the Roman Rd area which was called by the locals ‘the bunk’ because it provided an avenue of escape from the police. Anyway, there were times when Bethnal Green was actually green, the green coming from the fact that the hamlet had the usual village green around which the lads of the village lolled on Sundays. You can see them lolling still, outside the Salmon & Ball. Less than two hundred years ago, we are told, the district was almost entirely rural and the farmlands were so fertile that they could yield two crops a year. The change from an agricultural parish into an overcrowded slum began when a large number of Huguenots, fleeing from the religious persecution in France, introduced the art of silk weaving into Spitalfields and the south-west portion of Bethnal Green. Even now, after slum clearance schemes and Hitler’s bombs, there can still be seen the long-windowed, low-ceilinged cottages that housed the weavers, and in many places are the mulberry trees that were planted for the purposes of silk weaving. By the way, it is not uncommon to find in out of the way back gardens, grape vines – very old, but still bearing much fruit. The origin of the name is not quite clear, although one thing is certain, and that is that it has not always been Bethnal Green. It has at different times been Blithehale, Blythenhale, Bleten Hall and Bednal Green. It was at Bethnall House that Samuel Pepys brought his famous Diary for safe keeping whilst the Great Fire of London was raging. By 1740, the population had grown to 15,000, among these being a certain John Turpin. I know, for his name is clearly set down in the Parish Minute Book under the date 1720, the ink being faded but the handwriting with the old quill pen superb. The most picturesque story connected with this old community is that of Henry de Montfort, son of Simon de Montfort who was slain in the Battle of Evesham in 1265. Henry, it is said, was left for dead in the field of battle and blind through his wounds, was found by a Baron’s daughter who smuggled him away, nursed him and finally tokeep him from his enemies took the livelihood of begging and settled in Old Bethnal Green. The Blind Beggar of Bethnal Green has, through the years since, been the subject of song and story and has been officially recognised by using the Blind Beggar and his daughter Bessie as the Borough emblem. Coming from Shoreditch, the main thoroughfare, Bethnal Green Rd, runs through the heart of the district. At the very entrance to the Borough there are markets held on Sunday mornings, and people come from all parts of London because of the distinctive flavour of these parts. There is the piece of ground where, for a hundred years, dogs of every sort and price are sold. A little further along are birds, singing birds, for the cockney was a most ardent fancier. He still is, but I can remember when every barber’s shop had a long row of canaries and finches – dozens of them – around the shop, and in the summer they would be hung up outside the shop. In those early days, on a Sunday morning, one would always see dozens of workmen with their pets in their little cages, taking them to the Victoria Park. There the cages were hung on railings and left for hours at a time, the idea being, I suppose, that the free birds singing in the nearby trees and bushes would prompt the caged bird to sing. At these markets, all kinds of livestock were sold – rabbits, fowls, ducks and even goats, for the Bethnal Greener was an ardent backyard farmer, while hundreds of gardens held pigeon lofts. At the Bethnal Green Men’s Institute every year many prizes for livestock breeding are still won against people who come from all over England. Then there is another of these distinctive markets known as the Flower Market which is held in Columbia Road where, down the entire length of the street and on both sides are stalls from which are sold bulbs, flowers, bushes – in fact everything connected with the garden. The fact that this market has been going strong for half a century to my knowledge, will prove the East Ender to be quite a character, for people who have to live all their lives in a jumble of mean, huddled apologies for houses and who try to brighten the gloomy atmosphere with flowers, are obviously fighters. The Bethnal Greener has always liked to do his shopping in the open street, and in this case almost the whole of one side of Bethnal Green Rd is an open market. Stalls are set side by side in the gutter, and although the market constitutes a danger to traffic, and is a nuisance to the authorities, it still goes on merrily. More than once attempts have been made to do away with Sunday markets and the street market, always without success. It was in Bethnal Green that an unusual experiment was made to this end, by the Baroness Burdett Coutts, a wealthy and public spirited lady who, at a cost of £200,000, cleared a large tract of slums and had erected modern dwellings and a very fine building to be used as a market. This building had the appearance of a Gothic cathedral. The scheme never took on and was gradually surrounded and finally engulfed by the numerous small woodworking workshops that invaded the district from Shoreditch, and so the cockney trader still gaily shouts his wares from the gutter in Bethnal Green Rd. In the Victorian days, there must have been a pub on each corner of every street. Many of these are still there but many have been turned into workshops and in more than one case, into boys clubs and social welfare headquarters. Another feature that linked old Bethnal Green with our times were the many byways and courts that still, when I was a child, clung to their old fashioned cottage front gardens. In many places, building had been such that small group of cottages were built around and hemmed in until they formed a square hidden away from the rest of the Borough. Some of these old landmarks have gone, but for all their tumble-down condition, they always held an appeal for me. In summer, the bright flowers bloomed against the background of white-washed walls, wooden picket fences ran between the gardens, and it was a very poor cottage that did not have a couple of trilling birds hanging over the doorway. The cockney’s clothing was as full of character as himself. I have seen him, when a boy, on Sunday in moleskin or corduroy trousers almost white in colour, a heavy belt around his middle a heavy waist coat and a jacket that came down well over his hips with plenty of pockets and that most colourful touch, the neckerchief or choker. Collar and tie or bows were never thought of. Because of laziness? Oh no, he wore clothes with an air and took as much time selecting his choker as the old cowboy of Texas did. There was shop in Bethnal Green Rd, until Hitler removed it, that sold nothing but these squares of soft coloured silk and they cost more than a dozen stiff collars and ties. Of course, the cockney never wore anything but a cap and I can only think of the old time cockney as always wearing his cap at the back of his head and over one ear. Yes, he was a colourful soul with rigid principles and as independent as the nomad arab or the Western cowhand. But, like all these types, he is dying out – so many parts of the East End have changed. Where many of the coffee shops, of the ‘good pull up for the carmen’ fame were, are now Italian cafes with fake marble topped tables instead of the wooden high backed seats. Even the cockney of the coster barrow is being superseded by the cheap jack and our market places, which were once the homes of merry banter and good fellowship, are gradually coming under the influence of outsiders. That was the Bethnal Green of the past and, as some of the inhabitants have changed, so has the district itself. As I write, plans have been announced for the ceremonial opening of the first Bethnal Green Tube Station which is reported as being the underground station of the future. It has three escalators and is lit throughout with fluorescent lighting. The air is changed four times an hour through bronze grills on the platforms by an improved ventilation system. What a change in a short life time. When we were kids we used, on a summer’s afternoon, to sit on the curb outside the Salmon & Ball to wait for the horse trams and horse buses to pass with the conductors on top, when we would get on the platform to ride until the conductor came down. I shall think of those times, I know, whenever I use the Tube, for the new station is situated underneath the Fish & Globe, as the locals called the Salmon & Ball. The East End – My Birthright is a memoir of Turpin’s remarkable life. It includes first-hand descriptions of political events in the East End – fights with the Blackshirts, arrests, meetings in Victoria Park, as well as the Battle of Cable St. His descriptions of the Blitz and the destruction of his beloved East End are a rare insight into the lives of ordinary people confronted by unimaginable horrors. 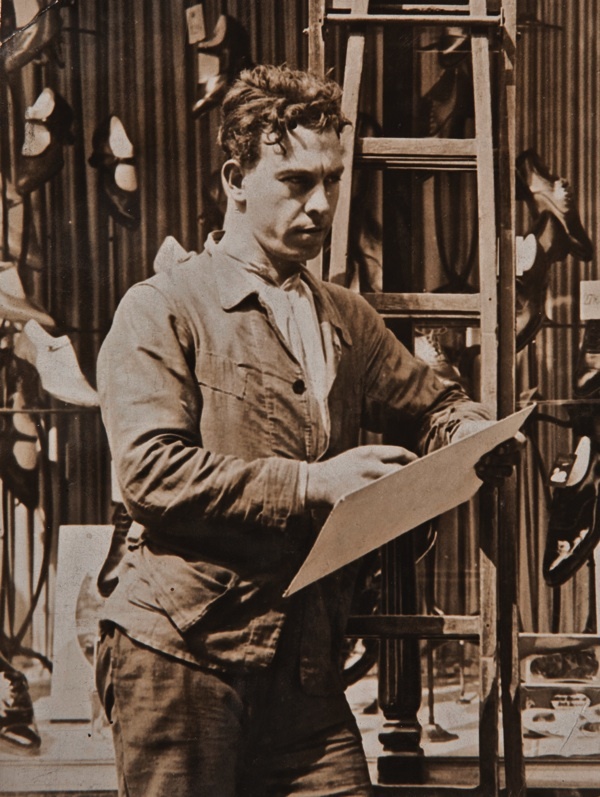 The book is illustrated by Turpin’s paintings and drawings as well as cuttings, posters and photographs from his family’s collection. Albert Turpin lived all his life in Bethnal Green. In the Great War, he served in the Marines and witnessed the massacre of Armenians in Turkey and the Russian Revolution. In the thirties, he became a Socialist, a Labour councillor and prominent anti-Fascist. Indeed, he was accused of being behind the disturbances at the Battle of Cable St, when a march by Mosley’s Blackshirts through the East End was fiercely resisted. In the Second World War he volunteered as a firefighter and saw action throughout the Blitz. 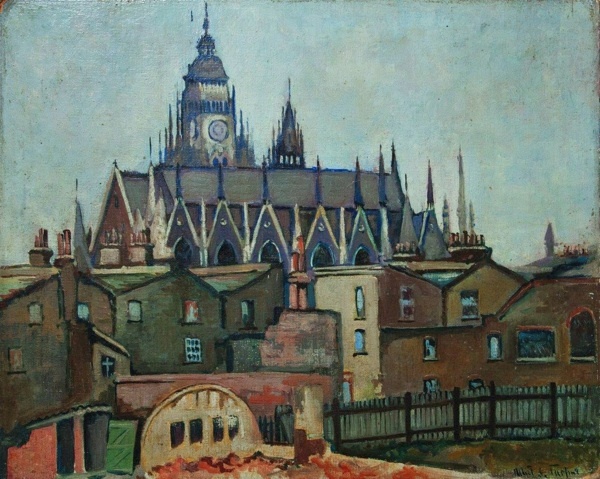 Turpin was an accomplished artist, involved with the East London Group of artists in the twenties and thirties. 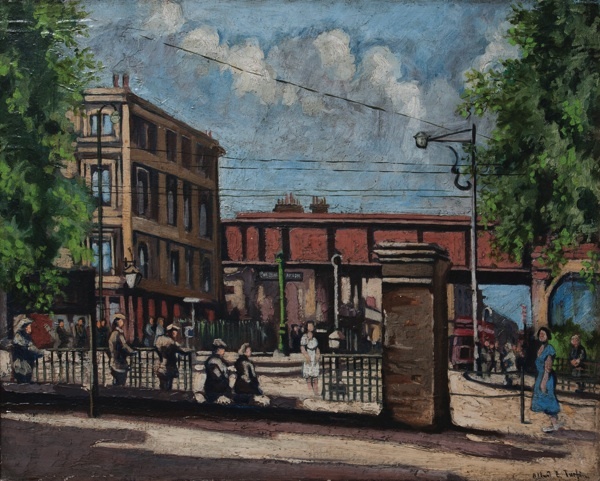 He sketched and painted throughout his life, after the war depicting the reconstruction of Bethnal Green. In 1946, he became Mayor of Bethnal Green. Click to buy a copy of THE EAST END, MY BIRTHRIGHT direct from the publisher Francis Boutle. Thank you so much for this GA, there is so much that interests me about this part of London and cockney life. I really relate to the description of how cockneys dressed as my grandfather and his two brothers are all wearing a caps perched at a jaunty angle on the back of their heads in every photograph that I have of them, and of course, my grandfather always wore a cap when I knew him although he had left London long ago. I was also interested in Baroness Burdett Coutts as she was a great friend of my relative, Frederick Francis Greenwood. I think you have also solved a mystery for me. I inherited, amongst my father’s possessions, a brightly patterned square of silk which I now believe must have been my grandfather’s choker, I cannot think of any other possible use for it, although I do now keep a few pieces of jewellery wrapped up in it as it is so soft. I am equally moved by these wonderful words but must also say when I saw his photo my first thought was WOW he’s hot. Not that he would have appreciated it much, but it is unusual for me to have that reaction.